Is there a time and a place for fur? In this vein, I have a theory that in Chicago, anyway, at a certain temperature, animal fur is considered slightly more tolerable. If you pressed me, I couldn’t argue why humans should wear fur, just the same way I know deep in my soul that humans probably don’t need to eat meat. We do it because it’s enjoyable and feels nice and it’s one of those ethical issues that, for some, is easy to not worry about. When some of us see a delicious buffalo wing, we don’t envision a miserable, trapped chicken and when I wear my very warm fur scarf, it doesn’t resemble a terrified, doomed fox (or raccoon? Or coyote? I have no idea.) It’s a moral elision, where it’s easy not to think too hard about it for those who don’t want to. But a lady (or gent! 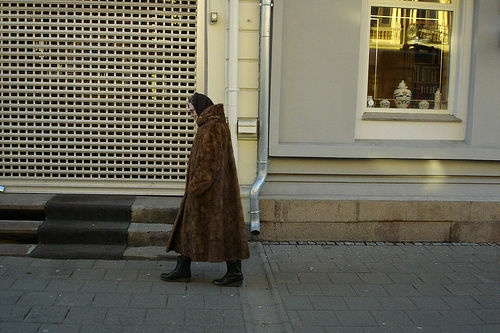 Because I’ve seen these guys) wearing a full-length fur coat on the bus in single-degree Chicago temperatures, stirs up far fewer objections, at least in my mind, than observing a fashionable young woman trotting around in a fur vest on Oak Street on a fall day*. The ends maybe do not justify the means but one fur coat looks like survival whereas the other simply is a sign of ostentatiousness. When the temperatures dip, wear what you want: pajamas, fur, a heating blanket plugged into a portable generator, whatever. Then again, perhaps it’s not a measure of whether some fur is justified and some is not: perhaps when it’s just that cold, one is too busy staying warm to have much of an opinion on what others are wearing. There are plenty of you out there for whom fur is never acceptable in any situation. But are there others out there who let their ethical (or fashionable) guard down the same time the mercury slides down? *For some reason, fur looks much less strange on older people than it does on the young.